Send and receive your electronic invoices interacting with Enterprises, Public Administration and Individuals online. Learn more The price doesn't change on the renewal! You can upload your invoices by online compiling, with the upload of the single file or via massive upload of a single period invoices (depending on the plan). The digitally signed invoice is sent to the Exchange System. You will receive notifications about the status of each invoice. Receive your accounts payable, straightly on the platform online, using our telematic code.If you subscribe your plan now you can also import all invoices received via pec. Accounts receivable with receipts and accounts payable are always available online. Digital Storage according to AgID. shopping_cart Add to cart Available soon! **You can type your invoices manually in the dedicated section of the platform. You can create your electronic invoices following a pre-set template, divided in sections, helping you to fill in all the required fields. For the recurrent invoices, you can create a template for each customer or kind of invoice, saving all the recurrent data (personal data, iban, etc.). The outgoing invoices are automatically stored in the legally compliant archive system. The application interfaces with any kind of business software via upload or download of XML documents and does not require any additional software installation. 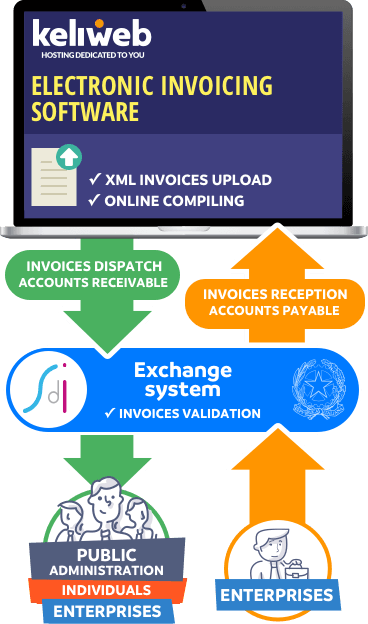 Our solutions use XML format, the only standard accepted by SDI for the electronic invoices transmission. Dispatch, management and SDI outcomes for accounts receivable; organized reception of incoming accounts payable and attribution of the accounting status. Legally compliant archiving of invoices and receipts for 10 years, with AgID accreditation. The accounts receivable, their related receipts and the accounts payable are stored and organized in 3 separate dedicated archives. Accounts payable can be indexed by the accounting cycle. All our plans provide 24/7/365 operative tech support, via ticket system. The application provides you the highest level of security using the digital signature guaranteeing the invoices integrity. A Time Stamp marks all the packages of payment. XML invoices are displayed according to the style sheet used by Agenzia delle Entrate (AdE). You can upgrade your plan to get additional features by paying a price difference, managing the whole process from your Customer Area. additional databases for your clients? An electronic invoice is a digital document, in XML (eXtensible Markup Language) format, according to the specifics of the A attachment of DM 55 of 3 April 2013, transmitted and delivered only via Sdl (Sistema di Interscambio). 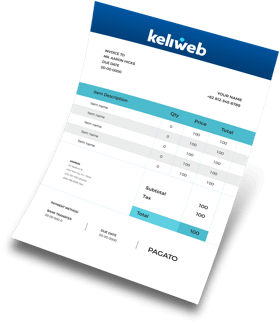 Using dedicated digital transmission channels, PEC or Receiver Code (Intermediary Code provided by Keliweb), the electronic invoice is delivered to PA or privates (B2B). It will be mandatory starting from 1 January 2019 for all private companies. All the subjects in the "benefit scheme" and in the flat-rate scheme are discharged from the previous dispositions. Both providers and PA will be able to delegate the conservation process of digital invoices. According to Decree 55 3 April 2013, all intermediaries of economic operators can provide services such as: invoicing in behalf of economic operators; transmission of invoices to the exchange system (SDI); digital invoices conservation. The cost refers to the fiscal year. For example, if you subscribe a plan on June 30 2019, it will expire on December 31 of the same year (subscription year). All the invoices of the (subscription) year can be put in storage, even if they have been released before the subscription ( June 30 2019). Supervise by-law your accounting management in the easiest way ever.